This is the last installment of a three-part series on students who have created products for sale. A sitting girl in a gray swimsuit with a strawberry for a head decorates Country Day water bottles and laptops across campus. Why a strawberry head? Ask senior Bella Mathisen, the artist behind the “Strawberry Girl” stickers. “I’m inspired by misogyny and the many forms it takes,” Mathisen said. “I have this series of fruit-headed women and girls — of which strawberry girl has gotten the most attention — to visualize how we as a society see women. While our society has progressed significantly, no one, unless exceedingly ignorant, will tell you that men and women are completely equal in society. Printed using StickerApp, these stickers cost $2 apiece. Additionally, Mathisen started selling her designs on Redbubble about 1½ years ago after hearing about her friends’ experiences with it. Redbubble sells user-submitted artwork on products ranging from stickers to shirts to pillow cases. However, Redbubble took down many of Mathisen’s first submissions because they were fan art and broke Redbubble’s fair-use policy, according to Mathisen. This didn’t deter Mathisen, who learned how to submit fan art under titles that didn’t trigger a fair-use violation; her best-selling item is a Father John Misty sticker. Every month, Mathisen earns about $5 from Redbubble. 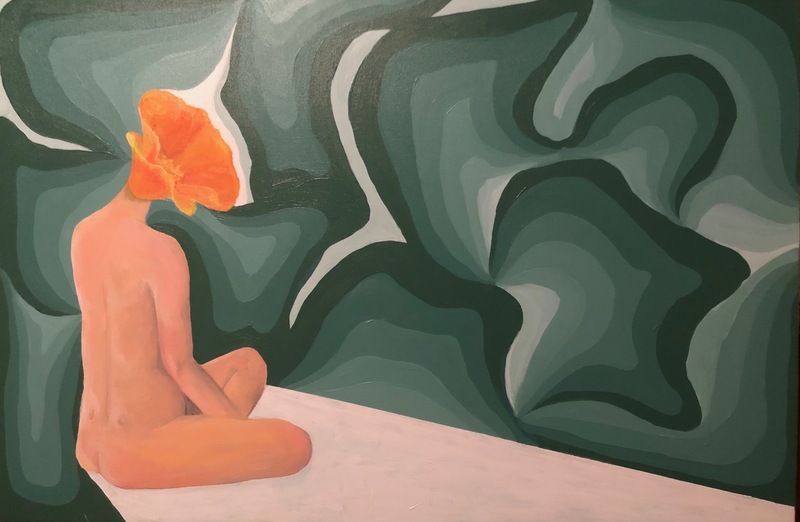 Artists make about 20 percent of their products’ profits, according to Isabelle Leavy, ’17, who also sells her art on Redbubble. Since uploading her first design in May 2017, Leavy has made approximately $400 from the sale of over 1,200 Redbubble products, according to her mother, AP Art History teacher Liz Leavy. Isabelle Leavy’s first Redbubble design — a starry, mountainous nature scene surrounded by the words “i wanna linger a little longer, a little longer here with you.” — is by far her most popular, earning Leavy $300 from 1,100 product sales, mostly stickers. She said she enjoys the “hands-off” nature of the site, as artists don’t need to advertise their work or interact with customers. Redbubble also turns Leavy’s gift ideas for friends and family into reality. While Leavy sometimes takes unofficial art commissions, Mathisen’s commission business has taken off since she officially started it about a year ago. Mathisen said she didn’t advertise commissions, but someone asked her, and through word-of-mouth, clients have commissioned over $1,000 worth of her art. Most customers commission Mathisen through her Instagram account, although some go through Twitter, often asking for art of pets or children. Commission costs depend on the piece’s size, material and time needed to complete. Mathisen usually charges $11 per hour, and material prices increase from watercolor to acrylic to oil paintings, the latter requiring a $20-$50 canvas. Through commissions, Mathisen has also been able to sell more of her original artwork. Freshman Vivian Conner has sold commissions since she was 12. During this time, she has tried selling art — almost solely animals and animalistic creatures, but she said she wants to improve on drawing humans — on several games and websites, some with more success that others. “I tried Amino Apps (an app containing user-created fandom communities), but communities were often made of kids who wanted free art and had no way to pay,” Conner said. She earns mainly site- or game-specific currencies, such as the in-game currency of Flight Rising, which allows users to have an in-game shop for selling art. “Having an art shop is a good way to get through games quicker,” Conner said. Pricing is Conner’s weak spot; she allows for generous negotiations with customers. Because she enjoys commissions, she said she underprices her art, usually charging $1-$5 of online currency or $5-$10 of “real” currency per piece. Often, her clients resell her art at a higher price, which Conner doesn’t mind. However, she said she still wants a transaction, so she will not give art for free. Some clients have unsuccessfully tried to swindle her. In total, Conner said she has made around $50 of real and in-game currency. Meanwhile, although junior Jason Li is new to selling art, he’s certainly not a pricing novice. His painting “Dawn in Times Square” is on display from March 1 to Saturday, April 6, in the RS Hanna Gallery in Fredericksburg, Texas, with a $1,500 price tag. Li’s painting was selected for exhibition after he applied to the “Best of America Small Painting National Juried Exhibition” from the National Oil and Acrylic Painters Society; it’s his first time exhibiting and selling his art. “The moment when you realize your work is being recognized by professionals — I really enjoyed that,” Li said. He priced the painting, which took 30 hours to complete, based on last year’s prices in the exhibition. Li said he might not sell other paintings in high school, though. Junior Madeleine Woo is less attached to her art pieces than Li — mostly because they’ll be destroyed by a baseball bat. Through Etsy (think of Amazon but focused on handmade or vintage products) Woo sold two piñatas, earning her a $14 profit. “My cousin really likes pineapples, and they’re a trendy thing right now, so I said, ‘I’ll do a pineapple!’ And I also love food, so I did a popsicle,” Woo said. She began creating piñatas after watching a video on piñata-making by YouTuber Kawaiisweetworld. Piñata-making is a three-hour process: design the template, trace it onto cardboard, cut it out, tape it together with an abundance of packaging tape, cut 1½ -inch strips of tissue paper, fold it, cut the fringe and glue it onto the cardboard layer by layer. But the next step was the downfall of her piñata producing: shipping. Shipping necessitated a box and stuffing to protect the delicate item, along with a trip to the post office for Woo’s mother. It also added to the piñata’s price, which totaled $19. Because the shipping process was too much work, Woo’s mother told her to stop selling piñatas and offered to help set up a photography website using Squarespace, a website builder. Woo plans to sell her photographs on this website, and a link to her Etsy will be embedded for purchase of photo prints. Additionally, Woo wants to sell puzzles of her pictures.